Paul Benjamin Auster (born February 3, 1947) is an American author and director whose writing blends absurdism, existentialism, crime fiction, and the search for identity and personal meaning in works such as The New York Trilogy (1987), Moon Palace (1989), The Music of Chance (1990), The Book of Illusions (2002), and The Brooklyn Follies (2005). His books have been translated into more than forty languages. Paul Auster was born in Newark, New Jersey, to Jewish middle class parents of Polish descent, Queenie (née Bogat) and Samuel Auster. He is the older cousin of conservative columnist Lawrence Auster. He grew up in South Orange, New Jersey  and Newark and graduated from Columbia High School in Maplewood. After graduating from Columbia University in 1970, he moved to Paris, France where he earned a living translating French literature. Since returning to the U.S. in 1974, he has published poems, essays, and novels of his own, as well as translations of French writers such as Stéphane Mallarmé and Joseph Joubert. Following his acclaimed debut work, a memoir entitled The Invention of Solitude, Auster gained renown for a series of three loosely connected detective stories published collectively as The New York Trilogy. These books are not conventional detective stories organized around a mystery and a series of clues. Rather, he uses the detective form to address existential issues and questions of identity, space, language, and literature, creating his own distinctively postmodern (and critique of postmodernist) form in the process. Comparing the two works, Auster said, "I believe the world is filled with strange events. Reality is a great deal more mysterious than we ever give it credit for. In that sense, the Trilogy grows directly out of The Invention of Solitude." The search for identity and personal meaning has permeated Auster's later publications, many of which concentrate heavily on the role of coincidence and random events (The Music of Chance) or increasingly, the relationships between people and their peers and environment (The Book of Illusions, Moon Palace). Auster's heroes often find themselves obliged to work as part of someone else's inscrutable and larger-than-life schemes. In 1995, Auster wrote and co-directed the films Smoke (which won him the Independent Spirit Award for Best First Screenplay) and Blue in the Face. Auster's more recent works, Oracle Night (2003), The Brooklyn Follies (2005), and the novella Travels in the Scriptorium, have also met critical acclaim. He was on the PEN American Center Board of Trustees from 2004-2009, and Vice President during 2005-2007. As of November 2010, Auster has been at work on a new novel, but has said that in the past few years he has found it harder to come up with ideas: "I used to have a backlog of stories, but a few years ago I found the drawers were empty. I guess I’m getting to the point where I tell myself if I can’t write another book it’s not a tragedy. Does it matter if I publish 16 or 17 novels? Unless it’s absolutely urgent, there’s no point in writing." In 2012, Auster was quoted as saying in an interview that he wouldn't visit Turkey to protest their treatment of journalists. The Turkish Prime-Minister Recep Tayyip Erdoğan replied: "As if we need you! Who cares if you come or not?" "According to the latest numbers gathered by International PEN, there are nearly one hundred writers imprisoned in Turkey, not to speak of independent publishers such as Ragıp Zarakolu, whose case is being closely watched by PEN Centers around the world", responded Auster. According to a dissertation by Heiko Jakubzik at the University of Heidelberg, two central influences in Paul Auster's writing are Jacques Lacan's psychoanalysis and the American transcendentalism of the early to middle nineteenth century, exemplified by Henry David Thoreau and Ralph Waldo Emerson. Lacan's theory declares that we enter the world through words. We observe the world through our senses, but the world we sense is structured (mediated) in our mind through language. Thus our unconscious also is structured as a language. This leaves us with a sense of anomaly. We can only perceive the world through language, but we have the feeling that something is missing. This is the sense of being outside language. The world can only be constructed through language, but it always leaves something uncovered, something that cannot be told or be thought of, it may only be sensed. This is one of the central themes of Paul Auster's writing. The transcendentalists believe that the symbolic order of civilization separated us from the natural order of the world. By moving into nature - as Thoreau did in Walden - it would be possible to return to this natural order. The common factor of both ideas is the question of the meaning of symbols for human beings. Auster's protagonists often are writers who establish meaning in their lives through writing and they try to find their place within the natural order, to be able to live within "civilization" again. Edgar Allan Poe, Samuel Beckett, and Herman Melville have also had a strong influence on Auster's writing. Not only do their characters reappear in Auster's work (such as William Wilson in City of Glass or Hawthorne's Fanshawe in The Locked Room, both from The New York Trilogy), Auster also uses variations on the themes of these writers. Auster claims that people are so influenced by the continuity among them that they do not see the elements of coincidence, inconsistency, and contradiction in their own lives: "This idea of contrasts, contradictions, paradox, I think, gets very much to the heart of what novel writing is for me. It's a way for me to express my own contradictions." Failure, in Paul Auster's works, is not just the opposite of the happy ending. In Moon Palace and The Book of Illusions it comes from the individual's uncertainty about the status of one's own identity. The protagonists start a search for their own identity and reduce their life to the absolute minimum. From this zero point they gain new strength and start their new life and they also are able to regain contact with their surroundings. A similar development also may be seen in City of Glass and The Music of Chance. Failure in this context is not the "nothing" - it is the beginning of something all new. Auster's protagonists often go through a process that reduces their support structure to an absolute minimum: they sever all contact with family and friends, go hungry, and lose or give away all their belongings. Out of this state of "nothingness" they either acquire new strength to reconnect with the world or they fail and disappear for good. But in the end, he manages to resolve the question for himself - more or less. He finally comes to accept his own life, to understand that no matter how bewitched and haunted he is, he has to accept reality as it is, to tolerate the presence of ambiguity within himself. — Paul Auster about the protagonist of The Locked Room, quoted in Martin Klepper, Pynchon, Auster, DeLillo. Ever since City of Glass, the first volume of his New York Trilogy, Auster has perfected a limpid, confessional style, then used it to set disoriented heroes in a seemingly familiar world gradually suffused with mounting uneasiness, vague menace and possible hallucination. His plots — drawing on elements from suspense stories, existential récit, and autobiography — keep readers turning the pages, but sometimes end by leaving them uncertain about what they've just been through. What Auster often gets instead is the worst of both worlds: fake realism and shallow skepticism. The two weaknesses are related. Auster is a compelling storyteller, but his stories are assertions rather than persuasions. They declare themselves; they hound the next revelation. Because nothing is persuasively assembled, the inevitable postmodern disassembly leaves one largely untouched. (The disassembly is also grindingly explicit, spelled out in billboard-size type.) Presence fails to turn into significant absence, because presence was not present enough. It’s interesting that the theme of Paul Auster’s novels is that American society is incoherent, that it lacks a true identity, and that it’s nothing more than a hall of mirrors. He’s been saying that for decades and by and large Americans don’t know who Paul Auster is and they don’t read him. Auster is tremendously popular in Europe, he’s been translated into more than twenty languages: those are the bulk of his sales. Americans are not interested in this kind of perception. The Inner Life of Martin Frost (2007) – "The Inner Life of Martin Frost" is a fictional movie that is described in full in Auster's novel The Book of Illusions. It is the only film that the protagonist watches of Hector Mann's later, hidden films. It is the story of a man meeting a girl – an intense relationship with a touch of supernatural elements. Auster later created a real movie of the same name (see "Other Media" section below). Here and Now: Letters, 2008-2011 (2013) A collection of letters exchanged with J. M. Coetzee. From 1999 to 2001, Auster was part of NPR's "National Story Project", a monthly radio show in which, together NPR correspondent Jacki Lyden, Auster read stories sent in by NPR listeners across America. Listeners were invited to send in stories of "anywhere from two paragraphs to two pages" that "must be true", from which Auster later selected entries, edited them and subsequently read them on the air. Auster read over 4,000 stories submitted to the show, with a few dozen eventually featured on the show and many more anthologized in two 2002 books edited by Auster. Paul Auster narrated "Ground Zero" (2004), an audio guide created by the Kitchen Sisters (Davia Nelson and Nikki Silva) and Soundwalk  and produced by NPR, which won the Dalton Pen Award for Multi-media/Audio, (2005), and was nominated for an Audie Award for best Original Work, (2005). In the 2009 documentary Act of God, Auster is interviewed on his experience of being struck by lightning as a boy. ^ "Theater Rigiblick - Spielplan - Kalenderansicht - Paul Auster liest". Theater Rigiblick. Retrieved 23 April 2015. ^ a b Freeman, John. 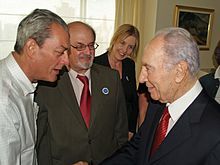 "At home with Siri and Paul", The Jerusalem Post, April 3, 2008. Accessed September 19, 2008. "Like so many people in New York, both of them are spiritual refugees of a sort. Auster hails from Newark, New Jersey, and Hustvedt from Minnesota, where she was raised the daughter of a professor, among a clan of very tall siblings." ^ Conversations with Paul Auster - Google Books. Books.google.ca. Retrieved 2013-04-20. ^ Begley, Adam. "Case of the Brooklyn Symbolist", The New York Times, August 30, 1992. Accessed September 19, 2008. "The grandson of first-generation Jewish immigrants, he was born in Newark in 1947, grew up in South Orange and attended high school in Maplewood, 20 miles southwest of New York." ^ Freeman, Hadley. "American dreams: He may be known as one of New York's coolest chroniclers, but Paul Auster grew up in suburban New Jersey and worked on an oil tanker before achieving literary success. Hadley Freeman meets a modernist with some very traditional views", The Guardian, October 26, 2002. Accessed September 19, 2008. "Education: Columbia High School, New Jersey; 1965-69 Columbia College, New York; '69-70 Columbia University, New York (quit after one year)"
^ "Board of Trustees: 2004-2005 | PEN American Center". www.pen.org. Retrieved 2016-01-15. ^ "Board of Trustees: 2008-2009 | PEN American Center". www.pen.org. Retrieved 2016-01-15. ^ "Board of Trustees: 2005-2006 | PEN American Center". www.pen.org. Retrieved 2016-01-15. ^ "Board of Trustees: 2006-2007 | PEN American Center". www.pen.org. Retrieved 2016-01-15. ^ Author interviews. "Paul Auster interview". Telegraph. Retrieved 2013-04-20. ^ Associated Press in Ankara (2013-03-27). "Turkish PM criticises US writer Paul Auster over human rights comments, Guardian, 01.02.2012". Guardian. Retrieved 2013-04-20. ^ Itzkoff, Dave. "Paul Auster Responds After Turkish Prime Minister Calls Him 'an Ignorant Man', The New York Times, 01.02.2012". Turkey: Artsbeat.blogs.nytimes.com. Retrieved 2013-04-20. ^ "A conversation with author Paul Auster". Charlie Rose. 2004-03-04. Retrieved 2013-04-20. ^ Goodyear, Dana (2014-03-17). "Long Story Short". The New Yorker. ISSN 0028-792X. Retrieved 2016-01-15. ^ "Book of Members, 1780-2010: Chapter A" (PDF). American Academy of Arts and Sciences. Retrieved 16 April 2011. ^ Paul Auster décoré par la France à New York sur le site de France 3. ^ "NYC Literary Honors - 2012 Honorees". nyc.gov. Retrieved 23 April 2015. ^ Another Paul Auster novel, 'Man in the Dark', was due to be published by Henry Holt in the U.S. on Monday 1st September 2008. ^ Akbar, Arifa (2009-10-30). "Innocence of youth: How Paul Auster excavated his own past for his latest novel - Features - Books". The Independent. Retrieved 2013-04-20. ^ "Amerikanske forfatterstjerner hjælper miniboghandel på Nørrebro". politiken.dk. Retrieved 23 April 2015. ^ Boxer, Sarah. "Sounds of a Silent Place" The New York Times. Sept. 11, 2004. Accessed Sept. 12, 2009. ^ Soundwalk Accessed Sept. 12, 2009. ^ Dalton Pen Communications Awards. Accessed Sept. 17, 2009. ^ Audio Publishers Association. Accessed Sept. 17, 2009. Dirda, Michael. "Spellbound." The New York Review of Books, 4 December 2008. "Strange things begin to happen when a writer buys a new notebook". The Washington Post, 21 December 2003. Paul Auster, Gérard de Cortanze La solitude du labyrinthe. Paris:Actes Sud, 1997. Franchot Ballinger Ambigere: The Euro-American Picaro and the Native American Trickster. MELUS, 17 (1991–92), pp. 21–38. Charles Baxter The Bureau of Missing Persons: Notes on Paul Auster’s Fiction. The Review of Contemporary Fiction, 14:1 (Spring 1994), pp. 40–43. Harold Bloom ed. Paul Auster. Philadelphia: Chelsea House Publ. ; 2004. Martine Chard-Hutchinson Paul Auster (1947- ). In: Joel Shatzky and Michael Taub (eds.). Contemporary Jewish-American Novelists: A Bio-Critical Sourcebook. Westport: Greenwood Press, 1997, pp. 13–20. Alain Chareyre-Méjan, Guillaume Pigeard de Gurbert. Ce que Paul Auster n’a jamais dit: une logique du quelconque. In: Annick Duperray (ed.). L’oeuvre de Paul Auster: approches et lectures plurielles. Actes du colloque Paul Auster. Aix-en-Provence: Actes Sud, 1995, pp. 176–184. (French) Gérard de Cortanze Le New York de Paul Auster. Paris: Les Éditions du Chêne-Hachette Livre, 1996. Robert Creeley Austerities. The Review of Contemporary Fiction, 14:1 (Spring 1994), pp. 35–39. Scott Dimovitz, 'Public Personae and the Private I: De-Compositional Ontology in Paul Auster's The New York Trilogy.' MFS: Modern Fiction Studies. 52:3 (Fall 2006): 613-633. Scott Dimovitz, 'Portraits in Absentia: Repetition, Compulsion, and the Postmodern Uncanny in Paul Auster's Leviathan.' Studies in the Novel. 40:4 (Winter 2008): 447-464. William Drenttel (ed.) Paul Auster: A Comprehensive Bibliographic Checklist of Published Works 1968-1994. New York: Delos Press, 1994. Annick Duperray, Paul Auster: Les ambiguïtés de la négation. Paris: Belin. 2003. (German)Sven Gächter Schreiben ist eine endlose Therapie: Der amerikanische Romancier Paul Auster über das allmähliche Entstehen von Geschichten. Weltwoche (31.12.1992), p. 30. François Gavillon Paul Auster, gravité et légèreté de l'écriture. Presses Universitaires de Rennes, 2000. Charles Grandjeat Le hasard et la nécessité dans l’oeuvre de Paul Auster. In: Annick Duperray (ed.). L’oeuvre de Paul Auster: approches et lectures plurielles. Actes du colloque Paul Auster. Aix-en-Provence: Actes Sud, 1995, pp. 153–163. Claude Grimal Paul Auster au coeur des labyrinthes. Europe: Revue Littéraire Mensuelle, 68:733 (1990), pp. 64–66. Allan Gurganus How Do You Introduce Paul Auster in Three Minutes?. The Review of Contemporary Fiction, 14:1 (Spring 1994), pp. 7–8. Bernd Herzogenrath Introduction. In: Bernd Herzogenrath. An Art of Desire: Reading Paul Auster. Amsterdam: Rodopi, 1999, pp. 1–11. Gerald Howard Publishing Paul Auster. The Review of Contemporary Fiction, 14:1 (Spring 1994), pp. 92–95. Peter Kirkegaard, Cities, Signs, Meanings in Walter Benjamin and Paul Auster: Or, Never Sure of Any of It in Orbis Litterarum: International Review of Literary Studies 48 (1993): 161179. Barry Lewis The Strange Case of Paul Auster. The Review of Contemporary Fiction, 14:1 (Spring 1994), pp. 53–61. James Marcus Auster! Auster!. The Village Voice, 39 (August 30, 1994), pp. 55–56. Patricia Merivale The Austerized Version. Contemporary Literature, 38:1 (Spring 1997), pp. 185–197. Christophe Metress Iles et archipels, sauver ce qui est récupérable: la fiction de Paul Auster. In: Annick Duperray (ed.). L’oeuvre de Paul Auster: approches et lectures plurielles. Actes du colloque Paul Auster. Aix-en-Provence: Actes Sud, 1995, pp. 245–257. James Peacock Carrying the Burden of Representation: Paul Auster's The Book of Illusions. Journal of American Studies, 40:1 (April 2006), pp. 53–70. William Riggan Picaros, Madmen, Naïfs, and Clowns: The Unreliable First-Person Narrator. Norman: University of Oklahoma Press, 1981. Mark Rudman Paul Auster: Some ‚Elective Affinities‘. The Review of Contemporary Fiction, 14:1 (Spring 1994), pp. 44–45. (German) Michael Rutschky Die Erfindung der Einsamkeit: Der amerikanische Schriftsteller Paul Auster. Merkur, 45 (1991), pp. 1105–1113. Edward H. Schafer Ways of Looking at the Moon Palace. Asia Major. 1988; 1(1):1-13. (German) Steffen Sielaff: Die postmoderne Odyssee. Raum und Subjekt in den Romanen von Paul Auster. Univ. Diss., Berlin 2004. (German) Joseph C. Schöpp Ausbruch aus der Mimesis: Der amerikanische Roman im Zeichen der Postmoderne. München: Fink, 1990. Motoyuki Shibata Being Paul Auster’s Ghost. In: Dennis Barone (ed.). Beyond the Red Notebook: Essays on Paul Auster. Philadelphia: University of Pennsylvania Press, 1995, pp. 183–188. Ilana Shiloh. "Paul Auster and Postmodern Quest: On the Road to Nowhere." New York, Peter Lang 2000. Eduardo Urbina: La ficción que no cesa: Cervantes y Paul Auster. Cervantes en el ámbito anglosajón. Eds. Diego Martínez Torrón and Bernd Dietz. Madrid: SIAL Ediciones, 2005. 433-42. Eduardo Urbina: Reflejos lunares, o la transformación paródica de la locura quijotesca en Moon Palace (1989) de Paul Auster. Siglos dorados; Homenaje an Augustin Redondo. Ed. Pierre Civil. Madrid: Castalia, 2004. 2: 1417-25. Eduardo Urbina: Parodias cervantinas: el Quijote en tres novelas de Paul Auster (La ciudad de cristal, El palacio de la luna y El libro de las ilusiones). ‘Calamo currente’: Homenaje a Juan Bautista de Avalle Arce. Ed. Miguel Zugasti. RILCE (Universidad de Navarra) 23.1 (2007): 245-56. Eduardo Urbina: Reading Matters: Quixotic Fiction and Subversive Discourse in Paul Auster’s The Book of Illusions Critical Reflections: Essays on Golden Age Spanish Literature in Honor of James A. Parr. Eds. Barbara Simerka and Amy R. Williamsen. Lewisburg, PA: Bucknell University Press, 2006. 57-66. Various Authors. Special edition on Paul Auster. Critique. 1998 Spring; 39(3). Florian Felix Weyh Paul Auster. Kritisches Lexikon der fremdsprachigen Gegenwartsliteratur (26. Nachlieferung), pp. 1–10. Curtis White The Auster Instance: A Ficto-Biography. The Review of Contemporary Fiction, 14:1 (Spring 1994), pp. 26–29. Eric Wirth A Look Back from the Horizon. In: Dennis Barone (ed.). Beyond the Red Notebook: Essays on Paul Auster. Philadelphia: University of Pennsylvania Press, 1995, pp. 171–182. John Zilcosky The Revenge of the Author: Paul Auster’s Challenge to Theory. Critique, 39:3 (Spring 1998), pp. 195–206. 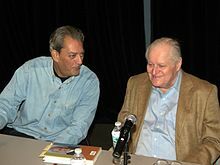 Wikimedia Commons has media related to Paul Auster.